Christmas congratulations are in order for parents across the country who welcomed new babies on Christmas Day. Among the earliest arrivals was a baby girl born at in Limerick University Maternity Hospital to first-time mum Nadine Keane (21) from Annacotty, Limerick. Lily Siobhan Duggan arrived at 12.27am weighing in at 6lbs 3oz. 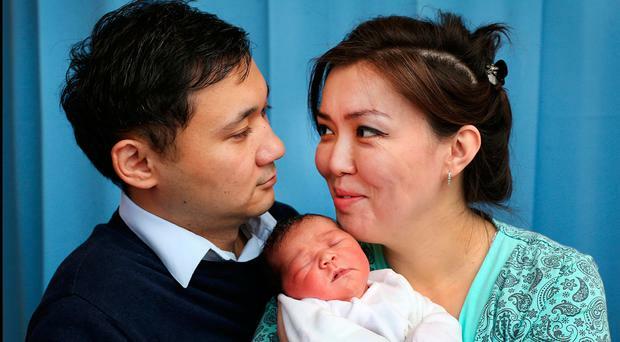 In the capital the National Maternity Hospital celebrated their first baby born on Christmas Day at 1.32am. Mum Augerim Utegnova, originally from Kazakhstan and loving in Dublin, is thrilled with her new arrival but has yet to decide on a name. Her husband, Kuna, has been living and working here for the past seven months. He said that she decided to move over to ensure they would both be together following the birth of their baby daughter. The couple – who live in Spencer Dock – were ecstatic with the news they had one of the first Christmas babies this year. The baby girl weighed in at 3.7kg. "She was overdue by 10 days, so just by accident we happened to be on Christmas Day," her dad said. "That’s amazing, it’s my first child and she’s been born in Ireland and on Christmas Day. "I only got married to my wife about a year ago. So what a change this year," he added. The couple haven’t settled on a name yet – but it’s in the works, he said. The delighted dad said when they have time to have a think they will pick a name. "There’s no name yet, but a there are a lot of options. "It’s crazy, my wife has been sleepless for the past three or four nights, now she’s been able to get some rest. "We’re so happy, there’s such a buzz around the baby," he said. "We’re really low-profile people, so we wouldn’t normally have the spotlight on us," he added. It is expected that close to 20 babies will be born in Holles Street alone on Christmas Day. Meanwhile, mum Sandra Money from Glanmire in Cork, was overjoyed to welcome a baby boy bright and early this morning - making it to the hospital just in time. Baby Kayden was born at 6.34 in Cork University Maternity Hospital (CUMH) and weighed 3.2kg. 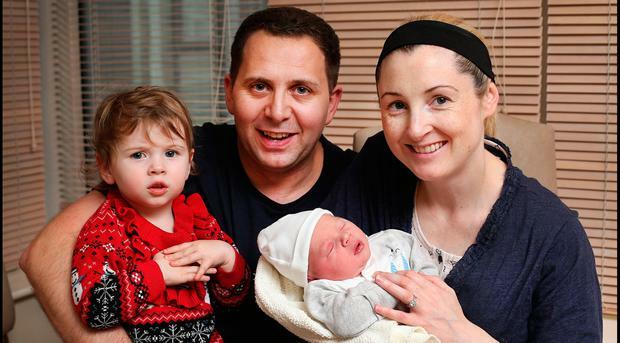 In the Coombe hospital in Dublin a yet-to-be-named baby girl was born at 4.10am to proud parents Serena Devine and dad, Kevin Devine from Kildare. The baby weighed in at 3.28kgs.